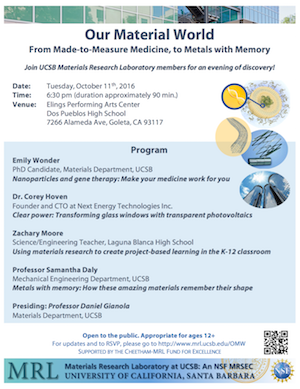 Join UCSB Materials Research Laboratory members on Tuesday, October 11th, as they share exciting developments in materials that impact our current and future science and technology. The public is encouraged to attend and the event is appropriate for ages 12+ and will take place at the Elings Performing Arts Center at Dos Pueblos High School (7266 Alameda Ave, Goleta, CA 93117). We look forward to you attending! To RSVP, please click here. And remember to check this webpage occasionally for updates.